Having switched to the T+A E Series Power Plant Balanced amplifier some time ago, and liking it a lot (see my review here), I was keen to take up the offer of a trial of the matching Music Player balanced, again courtesy of PQ Imports, the New Zealand Importer and Distributor. 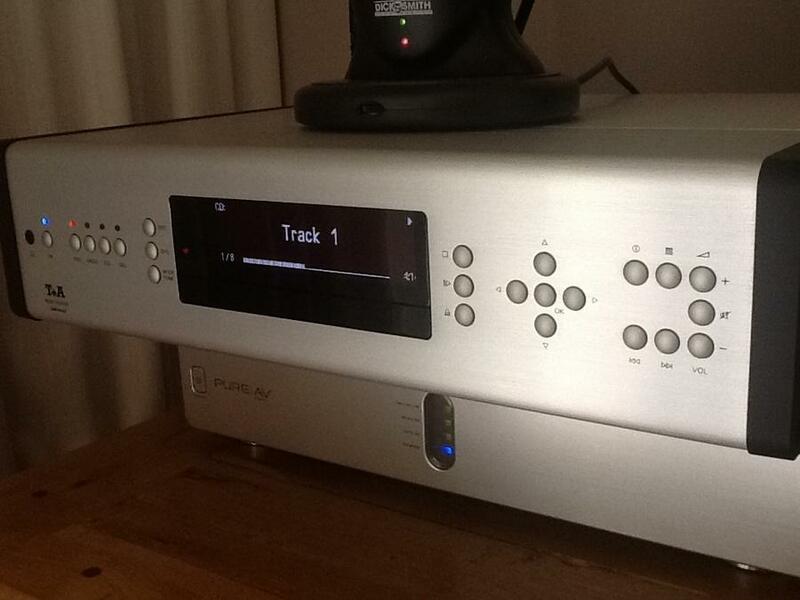 The Music Player is the digital source component companion to the Power Plant balanced amplifier. First impression, as before, is that the packaging is excellent with the unit supplied snuggly in a box within a box, and very easy to handle. Out of the box, I connected the power cord, connected the E-link cable to the Power Plant balanced amplifier (the E-Series unit cases are identical), connected Transparent Balanced MusicLink Ultra cables (NZ$ 4,999 - Transparent Cable) to the amplifier's XLR balanced sockets (also kindly loaned by Paul Quilter), and switched the symmetrical inputs on and the RCA inputs off on the amplifier, then connected the wireless antenna and radio aerial. Next I navigated the menu system to configure the wireless network connection by inputting my home network passcode. I then selected my music file library on my laptop and found an interesting album and pressed play. I then inserted and played a CD. All up about 30 minutes to get to first listening. The designation balanced for the Music Player and Power Plant reveals award-winning fully symmetrical signal processing through XLR inputs and outputs, so I was able to connect the Music Player to the Power Plant balanced amplifier using the Transparent balanced cables. Alternatively, the line out can be connected through RCA interconnects (the Power Plant has switchable outputs for RCA and XLR), and I used both options during my time with the Music Player. Some neat features are available in this comprehensive digital source unit. The Music Player is essentially a high-performance CD player with other digital sources and connectivity, plus FM radio receiver, so the unit can be used as a stand-alone system with headphones or powered speakers. It is a pre-amp in its own right, with pre-out and line-out, and tone controls which can be switched out of the signal path (the pre-amp is bypassed when the unit is connected to the Power Plant amplifier via E-link). A Music Receiver version with 2 x 100 W (8 Ω) is also available. The Music Player also handles digital FM VHF radio and Internet radio. This is exciting as now a huge selection of Internet radio stations can be accessed quite easily. A wire FM radio antenna is included in the kit, as is an adaptor for the BNC connector, but I had to find a female-female PAL coaxial joiner so that I could connect an external aerial. My amplified internal aerial wasn't quite up to the job, but this is due to local signal strength and obstacles around the reception point (metal windows frames and dense brick walls). Then I took a look at the Internet radio option which is simply a matter of using the preset categories to filter by genre, country, etc., then scroll through the lists of stations. Sound quality on Aardvark Blues FM was surprisingly very good at 128 kb/sec, for example. The Media Player is also a fully symmetrical double-mono DAC (32 bit) and will accept connections from 5 digital sources: three coaxial (32 - 192 kHz) inputs and two optical (32 - 96 kHz) inputs. The DAC has selectable FIR (linear response) and peak-optimised timing and dynamics oversampling filters, and normal and inverted phase output. The remote control also works the amplifier volume when connected to the Power Plant, and the amplifier on/off operates both units when they are linked by the balanced cables. The Music Player will also accept USB 2.0 connections from an iPod, MP3 player, and HDD or memory stick. T+A also provide a free of charge iPad iOS app control, called the TA Control. I also understand that Linn's Kinsky (FoC) can be used for Android devices, and PlugPlayer (NZ$ 6.99 at the time of writing) is also available for iOS. There is an optional bi-directional radio remote control handset with colour screen, although I didn’t get to try this. When connected to the home network router by CAT cable, the performance reaches 192 kHz / 32 bit, and is capped to maximum 48 kHz when connected wirelessly. Due to the location of my router in an upstairs room some distance from my listening room, I was unable to try out this higher resolution option and ran the music player streaming option entirely on wireless connection for the duration of the audition, without issue. On reflection, I would always use a hard wire connection rather than wireless for reliability of signal, as I do with my PCs, and a mains wiring network link is an option that I didn’t explore in this instance. Once I had played a few CDs and heard the obvious clarity of the music reproduction, I turned my attention to the Streaming Client function, as this extended music availability way beyond my own physical collection. I was able to play all of the music files on my laptop-connected external hard drives, and the set-up of the connection to my wireless home network was easy, requiring only the passcode. Then my music-dedicated laptop appeared on the list of sources, and I could see that an 804 kb/sec FLAC file was played at 2,116 kb/sec. Although finding albums and artists is straightforward, it does require scrolling through lists if you use the onboard screen and menu system, so a PC-based music library manager is a must for quick updates and searching (I currently use JRiver Music Center 21). The onboard menu is quite responsive, although it seems that each time this option is selected, the unit reloads the file database. There is a basic file search function. A real limitation in this remote operation is that once an instruction has been issued, the process must complete before any other action can operate. This may well frustrate in regular use. The menus are a bit limited and this is a consequence of using a small-format display, I think. An annoying issue is that stepping back through the directory hierarchy led to lengthy delays and occasional hanging, perhaps as the system re-polls the files in a large collection. Thus, I recommend using the wireless app and your favourite music library manager, and with JRiver Media Center, it all worked splendidly, with pretty much instant access. The T+A Control provides easy wireless control of almost all of the Music Player's functions, without requiring the line-of-sight contact essential for the optional FM100 remote control handset. A music library can be browsed, with display of titles, names, etc. Favourites can be marked and playlists saved for extra convenience. That's the claim for the app. I tried several times to use it, waiting at least 40 minutes for my library metadata to load, then finding that the file play button didn't work, and the other features are not obvious. I couldn't see how to control CD, tuner, or Internet radio. I sought help via the T+A website, and found a link to the website in the app and the user manual can be downloaded as a PDF file. The app interface is not as intuitive to use as I anticipated as a regular user of many mobile apps for other purposes. I used the search function to locate the music player, then selected it from the list. Once the connection was established, the sources appeared on-screen along with controls, and I was able to mute, adjust level, switch between sources, and see titles for what's playing. I was relieved that I could also play my music library using my iPad as remote controller using JRiver’s JRemote app which recognises the Music Player as a network device, thus linking the music library manager with the unit. This was immediately far easier to locate albums, artists, track titles, etc. In reflecting on my experience as a first-time user, I recognised the effect of the mystery of the unfamiliar. There's a point when the unfamiliar (read apparently exotic) and seemingly complicated becomes familiar, and that came about four or five days into the audition. I became aware that features were no longer mysterious and distracting, and listening to the music was once again fully absorbing. CDs were played effortlessly and detailed, and Internet radio was musically absorbing, even at only 128 kb/sec. Digital music from my PC-based library sounded great, given that all files were upsampled to 2,116 kb/sec. I didn’t have much time to spend with FM radio and I didn't get around to connecting any others sources. I enjoyed having this unit in my system, especially the facility to stream music files with control of my library management software from my listening seat. I also ran the unit as a DAC for my laptop optimised using Fidelizer Pro 7 to render outstanding sound quality from the JRiver Music Center 21 running on Windows 10. So, in summary, this is a fascinating one-stop alternative to discrete units, which sounds really very good and is easy to install and use. All digital sources are catered for, and when paired with the Power Plant amplifier to add phono, I effectively extended connectivity to my storage media and access to an almost endless supply of online music, and upgraded the digital performance of my entire music system. Much capability in a single box, and excellent sound quality - at this price and from this producer, I wouldn't expect anything less. The Music Player is a high-spec German-built CD player, DAC, FM tuner, digital streamer, and Internet radio. If I were to keep in my own system, it would not only extend my source options, it would replace five units, and upgrade the performance of my system. Maybe, then, the hefty price-tag seems more sensible as a substantial investment in audiophile quality music reproduction. This is a typical T+A product which does exactly what it is supposed to do, without drama.